Laguna Beach, Calif. (June 30, 2016)—Firebrand Media welcomes Justine Amodeo as editor and Denise Adams as publisher for the highly anticipated launch of Pacific Coast Magazine, focused on the iconic California lifestyle. In their new roles, the dynamic media team will bring Firebrand’s newest publication to life this fall. Amodeo is an award-winning writer and editor who was the Editor-in-Chief of Coast Magazine for 23 years. She has worked as an editor and writer for the New Haven Register, The New York Times and Omni Magazine and has edited custom publications for Design OC and Del Mar Escapes, among others. She has an MFA in Creative Writing from UCI’s prestigious writing program, and lives in Laguna Beach with her two children. Denise Adams has been in media sales and sales management for the past 25 years where she was a top producer for Coast Magazine and Freedom Communications, working with luxury clients across the country and abroad. “They will be extremely valuable to us as we launch this exciting new publication and continue to grow our media offerings in the region and nationwide. Everyone wins with these key additions to Firebrand, especially our readers and advertising partners,” said Nosek. Pacific Coast Magazine launches this September. 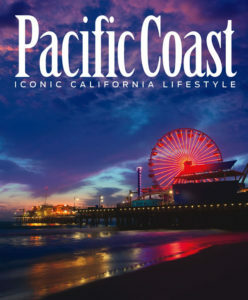 Pacific Coast Magazine celebrates the iconic coastal California lifestyle and its entrepreneurial and creative culture. Published quarterly and distributing more than 100,000 printed copies, Pacific Coast Magazine reaches the highest net earners in the most exclusive neighborhoods of coastal Southern California, stretching from Long Beach to San Clemente. Pacific Coast Magazine is made possible through a premier corporate sponsorship from HOM Sotheby’s International Realty and Stanfield Real Estate. Stanfield Real Estate specializes in all types of real estate throughout Southern California and has consistently been ranked as the #1 Team in Orange County and among the Top 10 in the nation by the Wall Street Journal. HOM Sotheby’s International Realty is the exclusive coastal and desert Southern California representative of Sotheby’s International Realty. As Orange County’s fastest-growing media company, Firebrand Media has used engaged storytelling to create regional and custom publications and digital content that inspire impactful media experiences, bringing brands and content to life in unique and meaningful ways. Their regional portfolio includes Newport Beach Magazine and Laguna Beach Magazine as well as the Newport Beach Independent and Laguna Beach Independent newspapers. Firebrand also produces magazines and content for numerous luxury hospitality clients including the Montage Hotels & Resorts, Meritage Collection, Omni Hotels & Resort, Sea Island Resort, Hotel Del Coronado, Salamander Hotels & Resorts, and Evans Hotels.